Almost everyone has noticed that the old marketing and sales playbook doesn’t work like it used to. You can’t cold call and sell your way into sustainable, predictable and repeatable revenue generation. 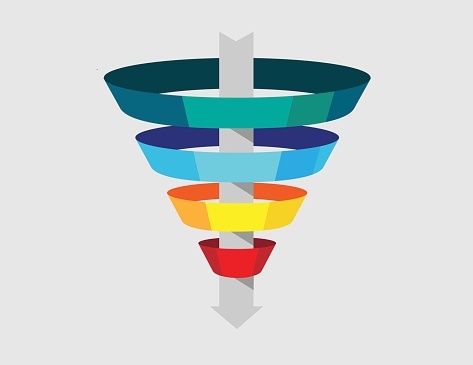 The old funnel (like the one pictured here) isn’t representative of your prospects’ buying experience anymore. Instead, you have to earn attention and get found by creating disruptive and compelling content, including your own company story. After you’ve earned that attention, you must nurture those prospects to continue the conversation while they proceed on their own journey. Then, when they are ready to talk to you, consider acting as your prospects’ guide while their buyer journey continues, helping them to get educated around their purchase decision, so they feel like your company is the safe decision. Do that and you’ll be rewarded with a steady stream of revenue. Now that might sound easy, but you have to do it at scale. This means it’s not enough for one person to be working like this. Your entire sales and marketing organization has to embrace these principles and change the way they execute all aspects of marketing and sales. But that’s not what this article is about. This article is about why we do things differently and how your prospects’ new buyer journey is affecting the concept of the “funnel.” To help, we created a new journey graphic that we think better illustrates today’s prospect journey. Take a look as we describe why this fits better today than the old traditional funnel. First, you’ll notice that the new buyer journey isn’t linear. It doesn’t start at the top and flow down to the bottom to finish. In our opinion, the series of cycles means each stage includes a set of experiences. If you do a good job in the awareness cycle, then you might move your prospect out and into the education cycle. If you don’t, your prospect might get stuck in that awareness cycle until additional information is provided or outside influences cause the prospect to progress. More on those influences in the next section. Our research shows that in most cases, prospects move from cycle to cycle not in sequence but based on the environmental factors that impact and influence their journey. Some of those factors include your marketing and sales execution. This explains why some prospects progress quickly and others progress more slowly. This means your content, website and lead nurturing work must be highly effective, data driven and perfectly designed based on your understanding of your prospects’ persona, pains and journey insights. Also, you should notice the cycle that wraps around after the final decision. You have amazing opportunities to work with customers and introduce new products/services or project opportunities. After the sale is done, the process has to continue. The cycles continue to spin. What you don’t see in this graphic is that factors inside and outside of your control impact these cycles. While your prospect might be moving along quickly, when they go dark, are slow to respond or reach out with contradictory feedback, it’s likely that one of these outside influences is now impacting their ability to move through the series of cycles. While you are not in control of these outside influences, you have to be smart enough to give the prospect an opportunity to share those inputs with you, so you can respond accordingly. You might not be aware that the CIO is now active in influencing your prospect’s decision. You didn’t identify the CIO and didn’t ask about their involvement, but now they are slowing down your prospect’s journey. You need your champion or contact person to give you that information, so you can adjust accordingly and then build into your process a point to make sure you don’t get caught unprepared again. 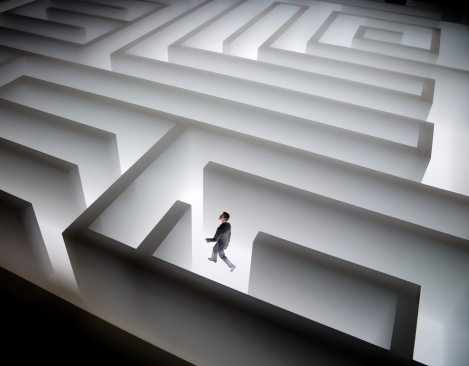 The biggest challenge is the sheer amount of information available to your prospects during their journey. Some of this is going to be supportive, some is going to be neutral and some is going to run counter to the process you’re trying to guide them through. Some is going to be content, some is going to be personal opinions, some will be from people they trust and some will be from other competing options. They’re going to be confused, and that confusion slows down your process. Your job is to position your company as the trusted source and your sales team as the trusted advisors. If you do this well, all of that conflicting information will come back to you through your prospect, and you can help them work thought that info and keep them moving forward. This is one of the big questions in sales: Do we try to help our prospects or do we try to sell to them? The more you try to help, the more included you’ll be in the content cyclones now part of each stage. The more you try to sell, the less included you’ll be and the more you’ll be at the mercy of other influencers. Speaking of the “guide” metaphor, never has this been more relevant. Take one look at this series of cyclones and it’s obvious that prospects are going to need guidance. They’re going to need guidance in the form of educational resources like videos, webinars, whitepapers, e-books and tip guides. They’re also going to need guidance in the form of a person they should trust to discuss their concerns with or get clarification when questions pop up during their journey. As you look at revamping your prospect experience from click to close, keeping the guide metaphor top of mind is going to serve you well. How do you guide someone on a trip? How do you get them ready for that trip? How do you help them take the right path when they have two or three options? How do you share industry information? How do you leverage your experience to make them trust that your guidance is the right guidance? Those are questions that your marketing and sales teams should be asking. They should then use the answers to create both marketing campaigns and sales processes that deliver the guidance required to help prospects navigate choppy waters. The ultimate goal is to remove uncertainty and help prospects feel like their choices are the safe choices. This moves people forward in their journey. Your prospects are pre-disposed to not believe you because they think you have an agenda and that you’re trying to sell them something. That means you’re going to need new data points to convince them to trust you, such as industry data, benchmark data and primary research data that you’ve collected from similar companies. Data makes people comfortable. Consider this example: You go to the doctor and he tells you about a condition you have. He then says not to worry, because it’s 100% curable. Now you feel better. Similarily, you’re telling your prospects they have a condition and you have the answer. When you share data on other customers and their experiences, your prospects feel better. When you share industry benchmarks from similar companies, your prospects feel better. The data you need at the beginning of this process is going to be different than the data you need in the middle and at the end of the process. Here’s another example: Prospects who are learning about inbound marketing during the awareness and education stage might want to know that companies using inbound typically realize a 64% lower cost of new customer acquisition. The data you need at the end of the process might include more specific results from your customers. For example, with site-wide technical SEO upgrades, our clients typically see about a 10% lift in new visitors to their website in the first couple of months. That data point helps validate their investment, directly relates to results and shows we know what we’re talking about. 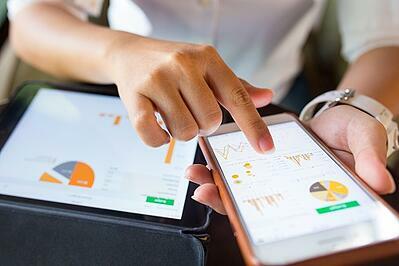 Beyond the data you’re providing prospects, you’re going to want to track lift from a better engineered buyer experience. You can measure the length of the buyer journey and work hard to shorten the cycle by providing better guidance and education. You can measure your content and your experience’s ability to move your prospects through each of the cyclone stages. You can strategically decide when and how to use your sales resources to make the handoff from marketing and sales to build a seamless experience for prospects. But the big takeaway here is that if you don’t adjust your marketing and sales execution to match the new buyer journey, you run the risk of watching the returns from your investment in marketing and sales continue to diminish over time. By adjusting to match the way your prospects are buying products and services, you’ll see more efficient marketing and more predictable revenue. Start Today Tip – If you look carefully at your current marketing and sales funnel data, you’ll uncover friction. It might be at the top of the funnel, where people are coming to your website but not entering the funnel. It might be in the middle of the funnel, where new contacts are not moving forward and providing additional information that helps you personalize the sales experience. You might also find a bubble at the bottom of the funnel, where people are not closing. These friction points are good indicators that your sales and marketing execution isn’t matched to your prospects’ buyer journey. Try working through your own buyer journey to see where the experience is mismatched, and then focus on reworking the experience to eliminate as much friction as possible. Square 2 Marketing – Revenue Is Earned With Experience, Methodology And Insights!